The top three spellers in fifth and sixth grade from each of the seven elementary schools competed on Friday, February 10 at Conestoga Elementary School. First up were the fifth grade spellers. After many rounds with participants spelling dictionary, independent, endurance, transparent and many other words, the final two spellers went head to head. Both spellers misspelled beneficial. 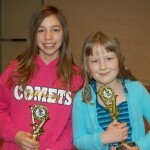 Then Eshleman fifth grade student Lisa Schaefer (left in photo) misspelled gopher. Central Manor fifth grade student Morgan Huber (right in photo) successfully spelled that word and then the next word, suspicious, and was declared the winner. After the fifth grade awards were presented, the sixth grade spellers took to the stage. Legitimate, extravagant, destitute, rhubarb, and genuine are just a few of the challenging words in the first round. 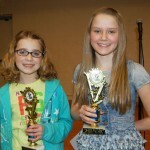 The final two spellers, Pequea Elementary sixth grade student Emlee Charles (left in photo) and Hambright Elementary sixth grade student Ava Dunford-Groves faced off in the final round. Ava misspelled the word miniature. Emlee correctly spelled the word and also the next word, harmony, to claim the sixth grade crown. Congratulations to all the spelling bee participants on a job well done!